Vigil for the Pittsburgh Jewish Community from Jewish Center of the Hamptons on Vimeo. The hearts of the Jewish community mourn the lives of Jews murdered during their Shabbat morning prayer service at the Tree of Life synagogue in Pittsburgh. What’s more, our sense of collective security has been shaken. We mourn, but we don’t sit paralyzed in fear. When tragedies like this happen, we shouldn’t forget the power of community to comfort, and the power of prayer to heal. 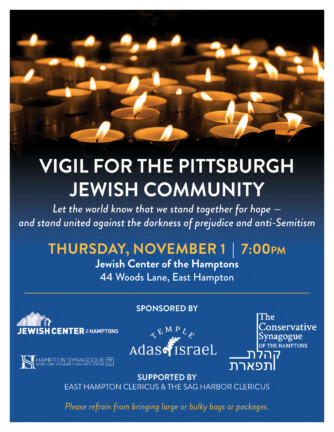 This Thursday, November 1 at 7:00pm, Jewish Center of the Hamptons is coming together with Temple Adas Israel, The Conservative Synagogue of the Hamptons, The Hampton Synagogue, as well as other local faith communities to hold a vigil for those slain at the Tree of Life Synagogue in Pittsburgh. Please join us at the Jewish Center of the Hamptons. Together we will comfort one another. If you cannot join us on Thursday, please come for Shabbat services Friday evening at 6:00pm and Saturday morning at 10:00am when together as a community we will honor the memory of those lost as together we recite Kaddish.